It's that time again to pack your bags and hit the road. In this year's edition of "Vacation Packing," I interview Colleen Wheeler, who is an O'Reilly editor in the Digital Media group, and an enthusiastic amateur photographer. I caught Colleen as she was preparing for a trip to Ireland to photograph a family reunion. We focused on making sure the well-heeled traveler has all the necessary pieces of equipment, but packed as compactly as possible. It's a terrific, informative conversation that I'm sure you'll enjoy. Colleen's travel pictures will be published on the TDS Flickr Public Group. 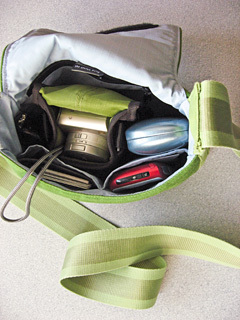 Shown here is Colleen's "day bag" that includes her Panasonic LX2, Treo 680, and a few personal items.